We’re very excited to be one of the first colleges in the country offering the new T Level qualifications. These two year technical courses launching in 2020, mark a milestone in the Government’s plan to transform education in the UK. Equivalent to three A Levels, they are ideal if you want to get into a skilled job. 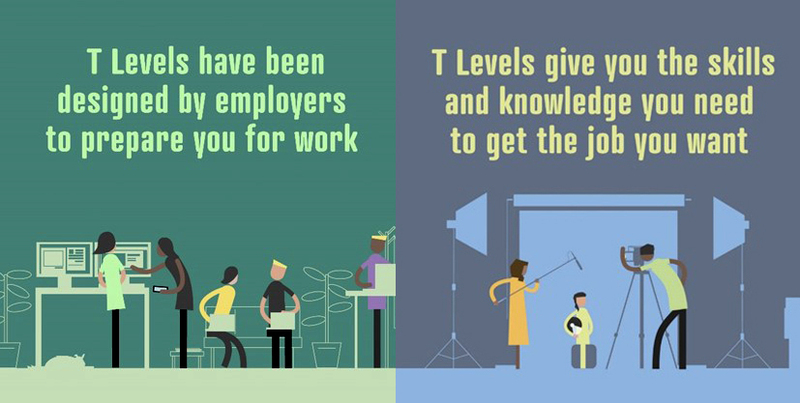 The content for each T Level has been developed in collaboration with employers and businesses to help you get the skills and knowledge you need to progress to university, highly skilled employment, higher technical qualifications or higher apprenticeships. They differ from Apprenticeships in that they give you the opportunity to get a broader idea of what it’s like to work in a particular sector with the option to specialise later. Apprenticeships are paid, work-based training for those who know what occupation they wish to pursue. Around 80% of your time is spent at College with the remaining 20% at your industry placement. This differs from an Apprenticeships which is typically 80% on-the-job and 20% in the classroom, and more suited to those who feel ready to enter the workforce. T Levels are made up of core skills, occupational knowledge, English and maths and an industry placement. Assessment is through a combination of examinations for the core skills and practical skills test for the occupational specialisms. Along with specialist teaching at BTC, your industry placement is a key part of the programme. Experience with a real employer in a real workplace will allow you to apply the skills and knowledge you learn in the classroom to the job, giving you a taste of the world of work you can expect once you complete your studies. Applications open in September 2019, so please complete the form below to receive more information.